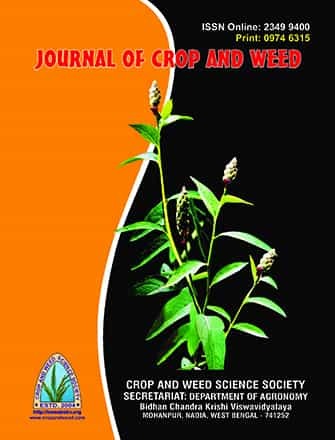 Welcome to "Journal of Crop and Weed"
The Crop and Weed Science Society (CWSS) is an organization of scientists, teachers, students, farmers, corporate and other persons/organizations willing to participate in the development of agriculture and allied fields. Since its inception, the CWSS is engaged in the betterment of agriculture and allied sectors. Main activities of the society encompasses promoting agricultural research and technologies through publications, demonstrations, dissemination of technologies through training programme, organization of awareness programme, recognizing commendable works in the field of agriculture and allied sectors through different awards and felicitation etc. As a result, the society is gaining popularity day by day as evident from its membership profile and the circulation of its publications, the Journal of Crop and Weed (P-ISSN 0974 6315, E-ISSN 2394 94100 and NAAS ranked) and the Crop and Weed Science News, in different parts of the world. Interested individuals / organizations, in the above goal of the society is welcome to become member of the society in the form of individual member / institutional member / corporate member and enrich the Society in achieving its goal.